From the spicy, smoky notes of our dry red through the lush, floral flavor of our sweet white, our wines are all about the fruit. 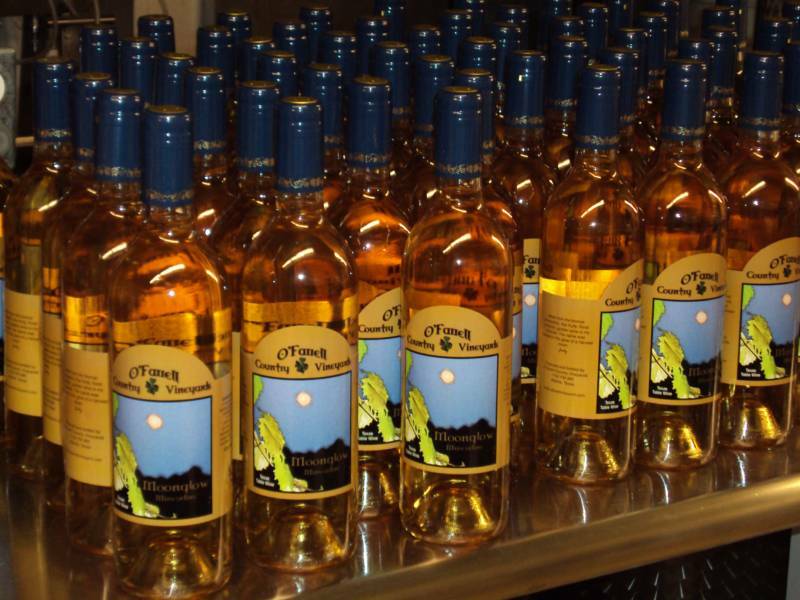 Tasting muscadine wine is a new experience for many people, and we're thrilled that many fans of European-variety wines like Cabernet, Merlot and Chardonnay have discovered exciting American wines to explore at O'Farrell Country Vineyards. And "red-wine-only-thank-you" folks often find they like our whites because of the full flavor of the bronze muscadines from which they're made. Muscadine grapes have a full aroma and typically make a fruit-forward wine. And our four fruit wines - made with blueberries, blackberries, peaches and plums -- offer other flavors new to many wine drinkers. We don't age them in barrels, so our wines don't have oaky flavors to compete with the taste of the grapes of fruit. Sometimes we, too, like to drink a nice buttery Chardonnay or deep, rich Zinfandel, and there are lots of good ones out there, but that's not what we make. We're a family with deep Texas roots handcrafting wines from a native-variety of grape and from fruits grown in the surrounding area. We love to give tastings to new and familiar folks, so come by our tasting room, and we'll walk you through our wines. We're still a small winery, so sometimes we run out of particular wines until we are able to make more. Magnolia: Made with a combination of Magnolia and Carlos grapes, this semi-sweet white will be bottled for the first time in the summer of 2016. It has a full aroma (or nose) like any good muscadine wine, but with notes that are all its own. Moonglow: A perennial favorite. This sweet white is very aromatic, and full of flavor. It's wonderfully representative of the Carlos muscadines from which it's made, and it frequently triggers fond memories of wine or jelly making among folks familiar with bronze muscadines (or scuppernongs, as some people call them). Vintage Country: We finished this dry white wine in the spring of 2016. Birthed from the same Carlos grapes as it's sweet sister, Moonglow, it shares the same wonderful nose and full flavor, but with a great clean crispness. Sassy Sisters: Another longtime fan favorite. Sassy is named for our winemaker Judy and her sister, Becky, who adorn the label. Judy uses a combination of Carlos and our black grapes to make this sweet blush. Smokehouse Red Dry: Spicy but fruit-forward, floral but dry, this full-bodied red is full of contrasts that help it defy some wine conventions. Our small, dark Noble variety muscadines give this wine its color and flavor. Smokehouse Red Semi-Sweet: Smooth. That's the word for this red that retains some of the spiciness of its dry twin sister but offers a more rounded flavor. Smokehouse Red Sweet Memories: Like all of our Smokehouse wines, the label for Sweet Memories features an old smokehouse that winemaker Judy's grandmother once lived in. Look closely and you can see Granny Grunt standing in the doorway. A medley of our black muscadine varieties give this wine its flavor. Blackberry and Grape: Another study in interesting contrasts. Blackberries from nearby Moss Springs and our black muscadines blend here in sweet wine that has a dry finish. This robust red benefits from both its parental fruits. Blue Diva: Blueberries from down the road in DeBerry, Texas, give this sweet red its taste. The eyes of winemaker Judy's youngest granddaughter, Cassie-Jo, give it the distinctive label. Like any good diva, this fruity treat has developed its own devoted fan base and continues to gather more. Cheeky Peach: Think fresh peach, like biting through the velvety skin. That's the flavor of this strong-minded sweet white. Chill it as cold as you want, and it will still bring a big, refreshing taste that starts with peaches from Pittsburg, Texas. Plum Crazy: This rose-colored beauty is a sweet, light sipping wine made from plums off of our tree and from Pittsburg, Texas. One of our customers loves it as the base for marinade when he makes ribs, and it pairs well with the smoky, sweet meat.